Recycle Used Oil And Filters Quickly, Safely And Easly With the Crushmaster Oil Filter Crusher From Ben Pearson. The CrushMaster 2 is built tough, for years of trouble-free operation. 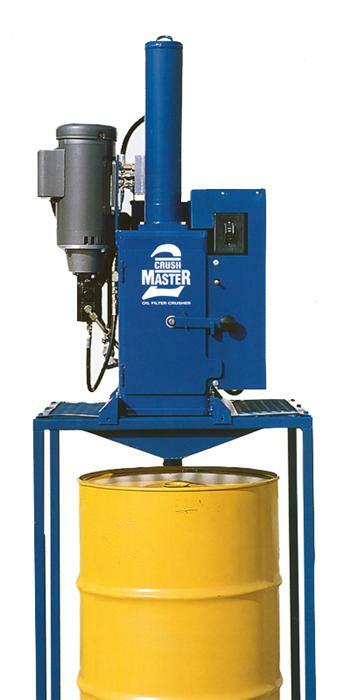 Made of solid steel plate construction, the CrushMaster 2 oil filter crushing system is designed for heavy-duty use, and will accommodate both standard size filters and heavy-duty truck filters up to 16" in height. Built-in operator convenience and safety features include convenient waste oil drain connections, easily located on/off switch for safe operation, and heavy-duty 2hp motor delivering 37,500 pounds of crushing force. The optional stand, which accommodates both CrushMaster models, is built to withstand years of punishment and is designed with a heavy-duty grated top for draining of filters before crushing. The CrushMaster 2 from Ben Pearson, it's a heavy-duty oil filter crusher built to perform. 37,500 lbs. of crushing force. Able to crush up to four automotive spin-on filters at one time. Clean and efficient design can be connected to a variety of waste oil containers.